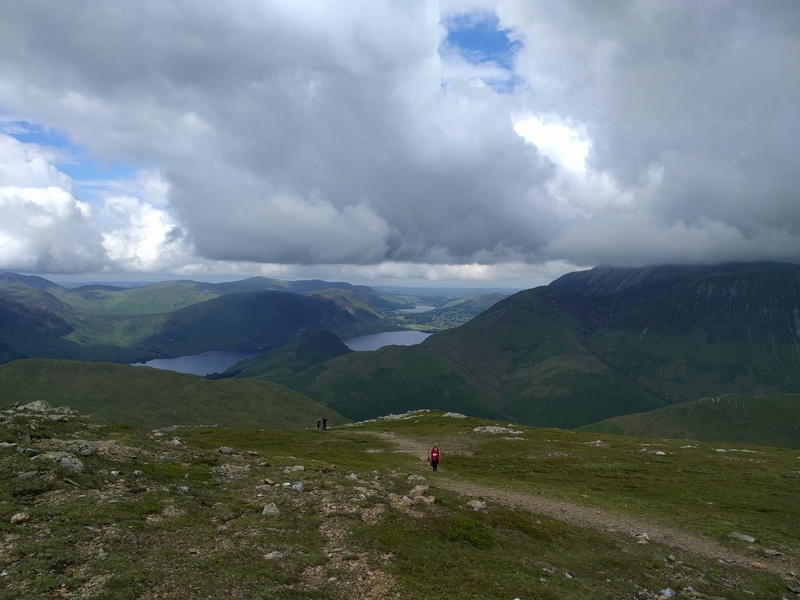 From far and wide they came – the south west, the south east, the bit in the middle, and one on foot from Langdale – the Social Hikers gathered near Keswick for our third crack at the 10-in-10 and 5-in-5 in aid of MS Society. Now less a gathering of people who know each other online but had never met face to face, increasingly these meets are bringing together established friends. Old banter and jokes are reworked and the fun continues where it left off last time. Indeed, this is a group of people highly valued in my list of friends as these are the people with common interests and who I choose to spend time with. In one sense it was appropriate that we assembled in the aftermath of such a momentous week in our country to provide mutual support for a decision that didn’t go our way. Colin, Cath and I pitched up at Braithwaite Bridges campsite near to Tim & Christine and then milled around waiting for the others to arrive. In dribs and drabs they turned up. Cake was offered and accepted. The news was reworked over and over again, without getting old. 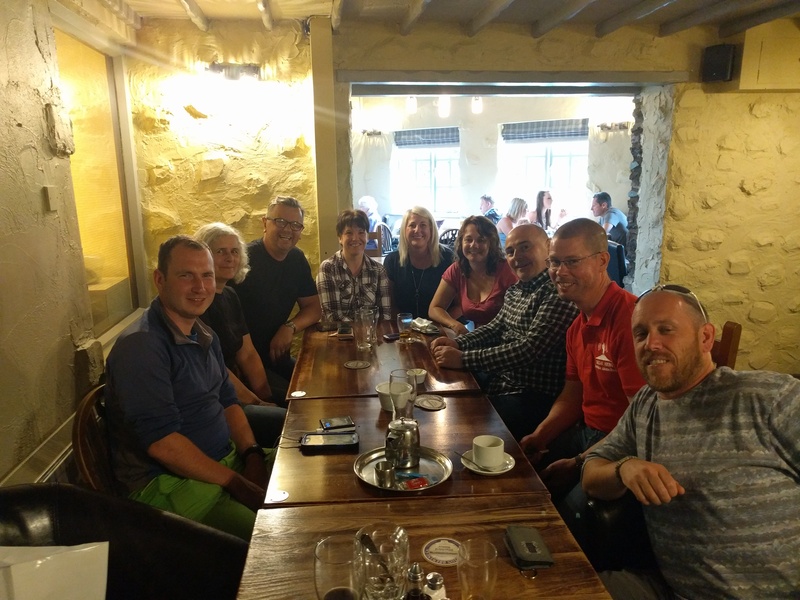 Eventually all but Rich and Jilly were with us and we decamped to the pub, to do what we do best – beer and banter. A relatively early night was had. I woke, as is my wont when camping, very early indeed. 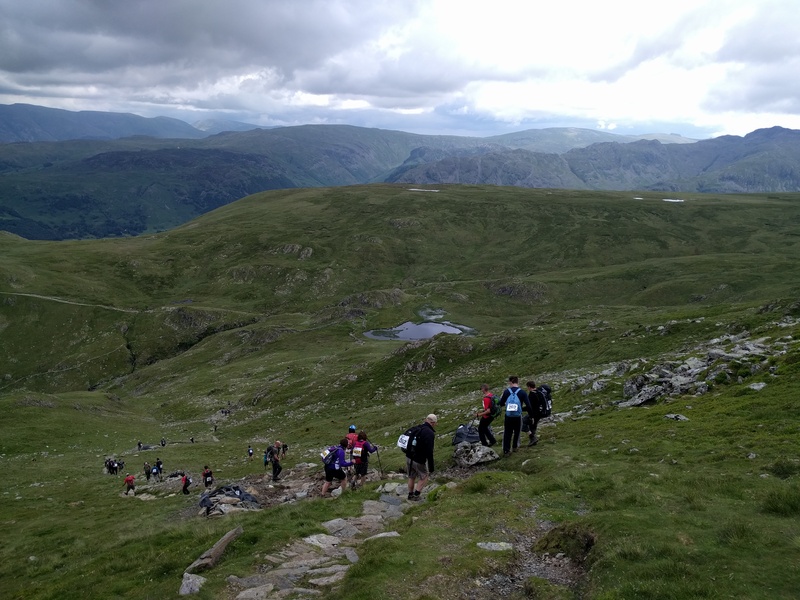 The ‘A’ team consisting of our 10-in-10 cadre were up and preparing to leave – they were gone by the time I got back from the ablutions. 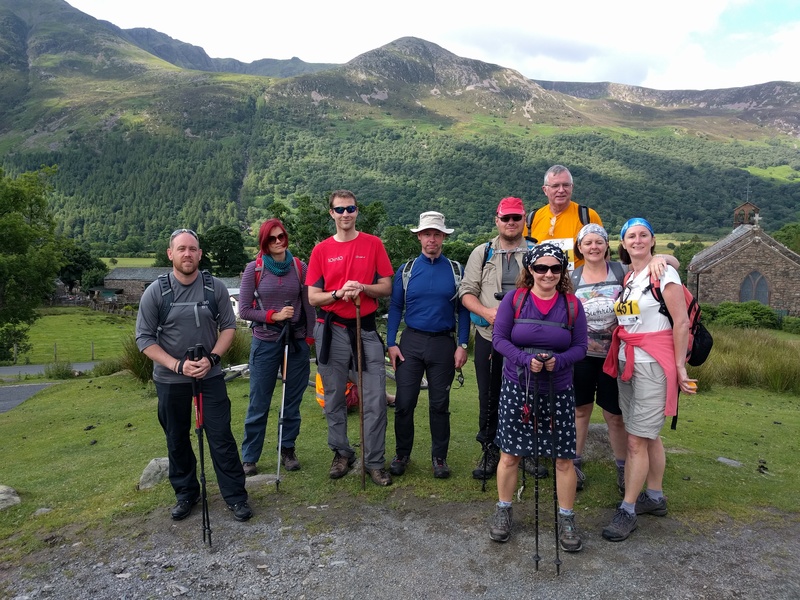 Soon it was time for the ‘B’ team to depart for Buttermere and the start of our walk. 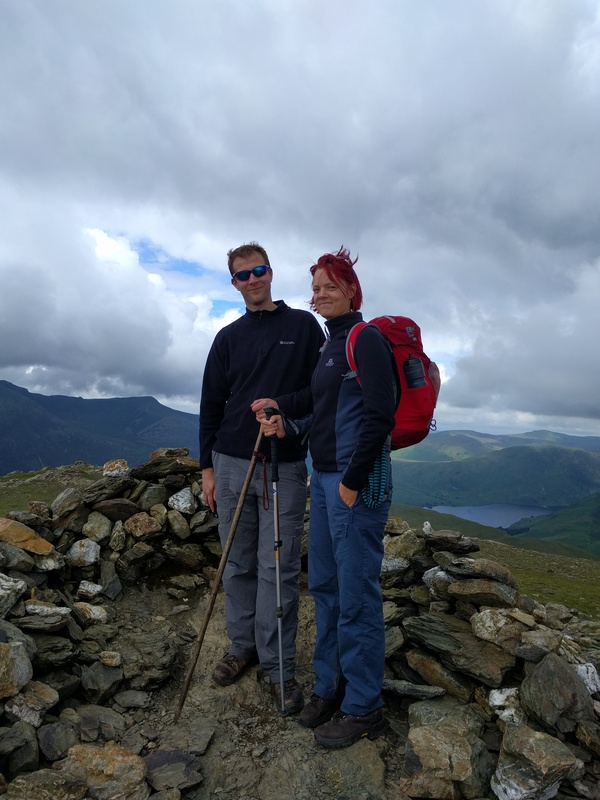 The bus dropped us in Buttermere and we walked up to the start point just behind the church. A bit of milling around attaching race numbers, during which a reader of my blog (good to meet you Brian @benwickrambler) came up and introduced himself. We then we posed for a group photo and set off. It was immediately apparent that our posse of 9 was going to naturally fall into 2 or 3 groupings. Phil, Sarah and Pete were off like startled hares, the Stoke contingent and I were heroically forming the rearguard, and Jim and Col were bridging the gap between. 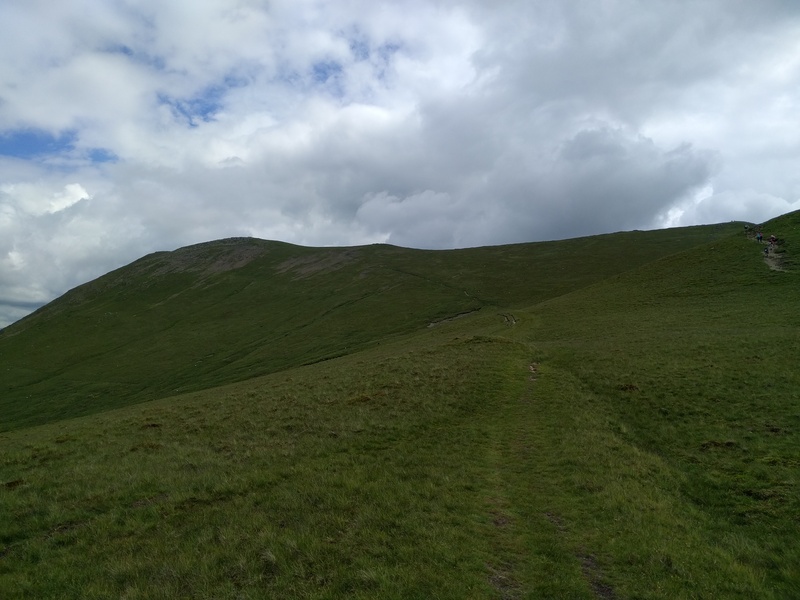 We stayed more or less within touch on the way up to High Snockrigg (peak 1) and Robinson (peak 2), but started to fragment on the way over Hindscarth. 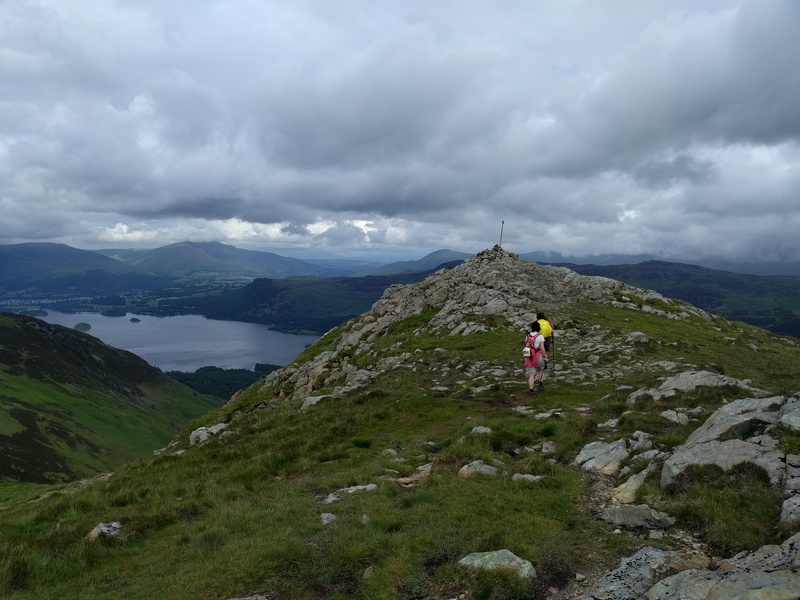 Cath and I detoured to pick off the actual summit – out along the ridge – leaving the remnants of the rearguard to soldier on until we could recatch them on Dale Head (peak 3). 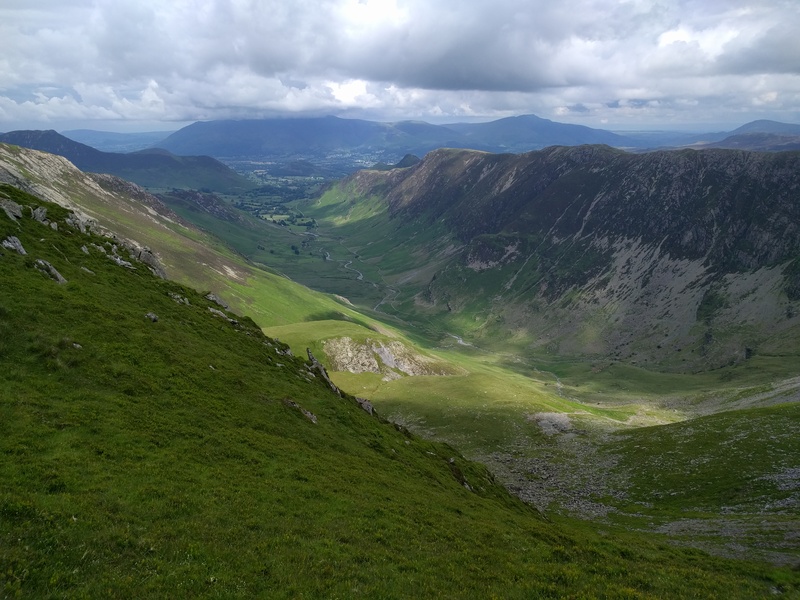 Cath and I got to Dale Head, and there was no sign of the advance party. We wouldn’t see them again until the pub. 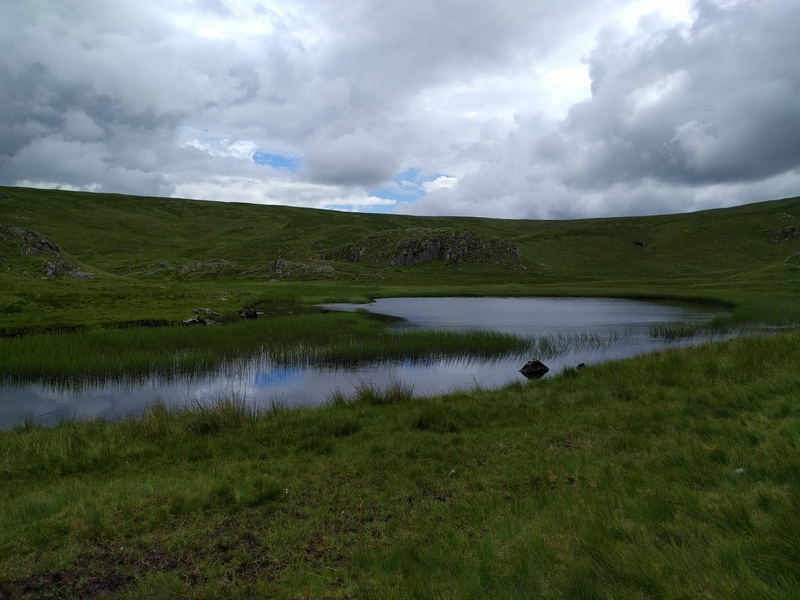 A short lunch stop was called on Dale Head, in part to defer the horror of the worst part of the walk – the descent to Dalehead Tarn. 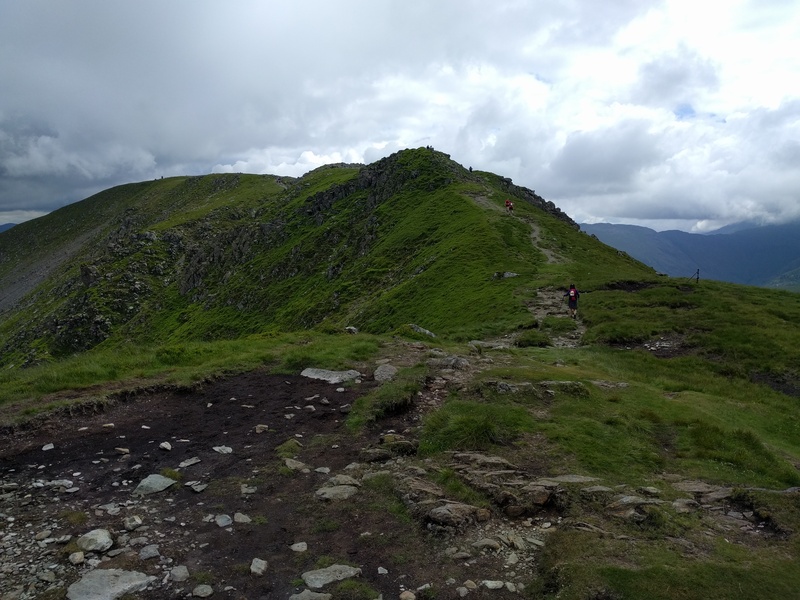 Somehow, I managed to fall to the back of the group during the descent whilst my knees cried out in pain, and it took a bit of effort to catch them again on the way up High Spy (peak 4). 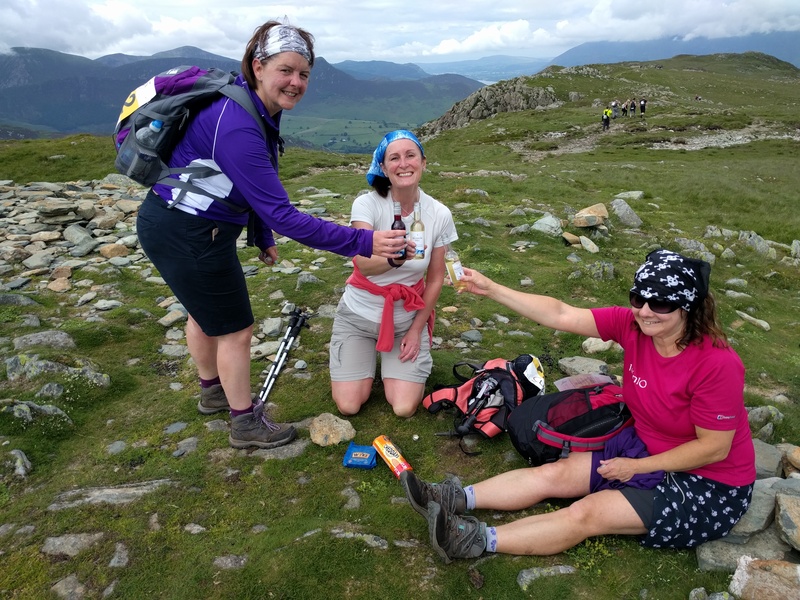 We arrived atop High Spy, Jim and Col had forged on, Cath, Cathy and Dianne thought the moment was right to hold a cheese and wine party. As you do. A few spots of rain fell as we departed from High Spy, and rain jackets were donned for about 30 seconds before being removed again. The girls and I ploughed on, making the short detour to High Spy North Top, and attracting fellow 5-in-5ers and 1-in-10ers like a Pied Piper leading rats. A couple of times I confused them by saying this wasn’t the route and we were detouring for a bonus peak. Cue looks of bewilderment. But we were only 100 yards or so off the main path anyway. The descent to Maiden Moor (peak 5) was a bit of a non-event, and we knew the walk was in the bag already at this point. 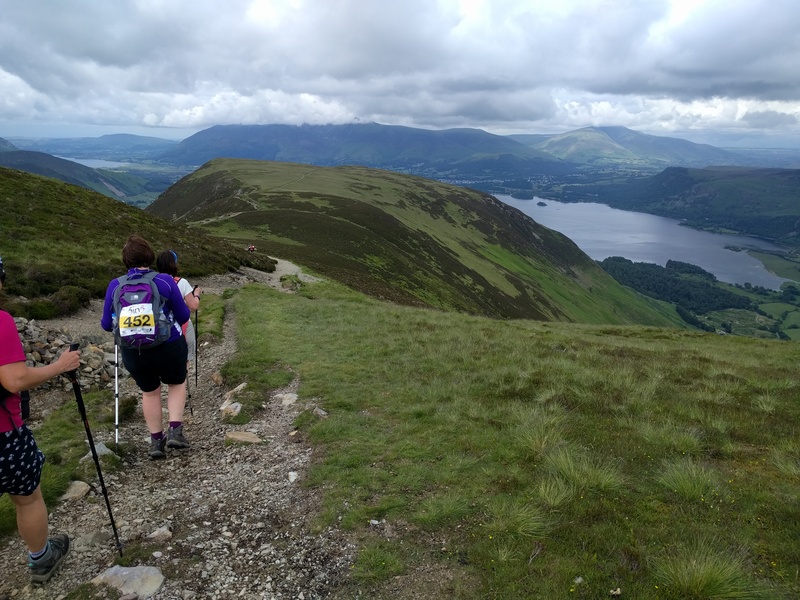 Cath and I left Cathy and Dianne to follow the stream of participants down the gradual path to the end, while we briefly popped up onto Catbells for our third bonus peak. 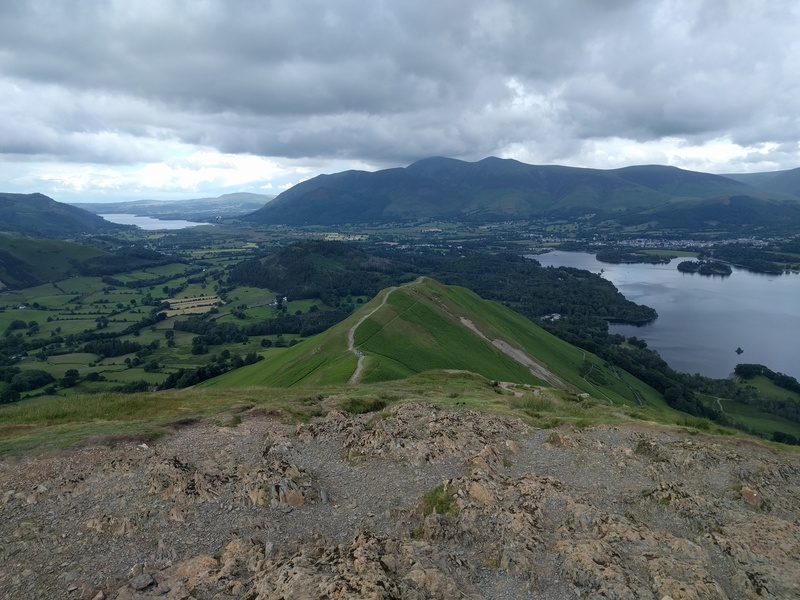 In so doing, I ensured that I completed the “bag” of all of this set of fells on Social Hiking, having last visited in 2008 well before I started using it. Cath and I headed to the end and were the last to arrive from the Clan, somehow having been overtaken by the ‘A’ team somewhere en route. We settled in for an evening in the pub. Which made a change. The walk back to the campsite along the lanes got us there just in time before the heavens opened and everyone took refuge in their tents. Gradually people slipped away the next morning, the members of the Clan spread to the 4 winds, but Cath, Col, Rich, Jim and I headed for a rendezvous in Ings with local friends Ria, Bob, Gina, Dave, Sarah and John. 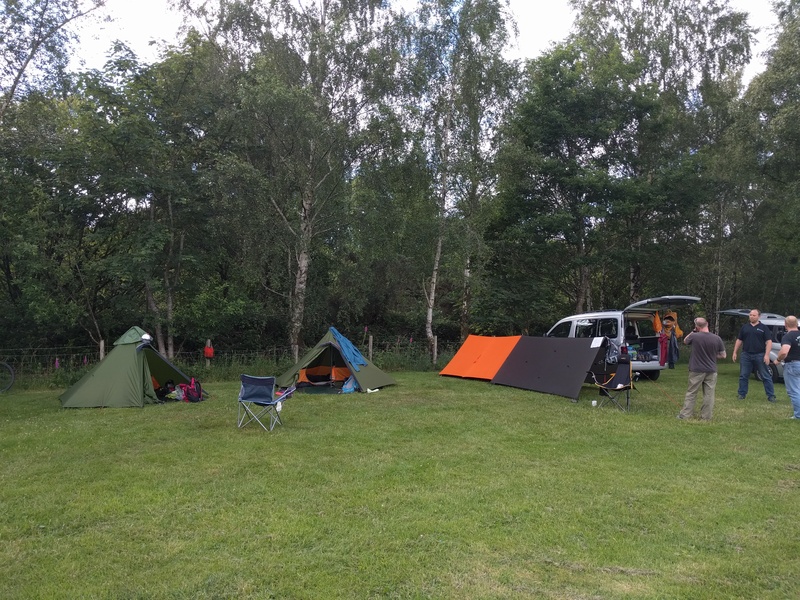 Then we headed home with a rough plan for a summer meetup in the Peak District next year, but with the near certainty that many of us would be bumping into each other locally or, most likely, on Dartmoor. Good to meet you to. 5in5 was enough for me and I doubt if I’ll ever enter the 10in10.